For most people, Belize conjures images of crystal clear Caribbean waters and world class diving, however in May 2006, I discovered the interior jungles are filled with mystery and adrenaline-pumping adventures. The highlight of my two week backpacking trip through this unique country was a 3-hour cave tour of Actun Tunichil Muknal (“ATM”), also known as the Cave of the Stone Sepulcher. The Mayans used the cave over 1,200 years ago for ritual sacrifices. 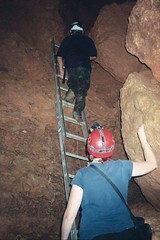 The expedition began with a 45-minute drive from San Ignacio, a city near the western border with Guatemala, to the entrance of the park which contained the cave. Our eight person group hiked for 20 minutes along a jungle trail, wading across three streams, until we arrived at a staging area used by Thomas Miller, the archaeologist who discovered ATM in 1986. It consisted of a campfire site, outhouse, and small roofed area. We donned our helmets and headlamps, climbed down a small bank, and began to swim upstream into the ominously dark, hourglass-shaped entrance of the cave. After a few minutes, the headlamps were our only source of light, while the cool water being splashed around was the only sound. Walking single file, my eyes were consistently focused on the foot placement of the person in front of me. Twisting an ankle or falling on the slippery rocks was a real danger. Our guide navigated us through spaces small enough to confound a contortionist. Eventually, we arrived upon a giant boulder, which we climbed up in order to reach the dry chambers containing ancient Mayan pottery and remains. Due to the sensitive nature of the archaeological site, we were all required to wear socks, which were sopping wet by this point. Great care was given to walk only where our guide walked, as we navigated through the eerie chambers of stalactites and stalagmites. 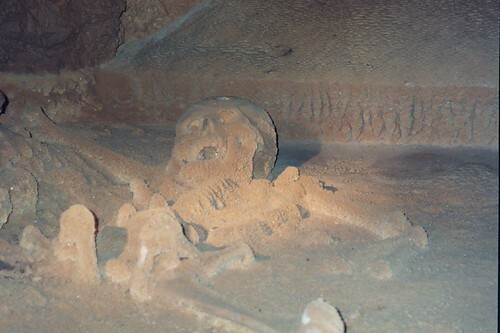 The ultimate reward for our efforts was the opportunity to climb up a 12-foot ladder to a small chamber containing the full, calcified skeletal remains of a young woman who had been sacrificed to the Mayan Gods. This experience left me feeling like Indiana Jones. It was truly one of the greatest adventures of my life. Tour entries into ATM are timed so you rarely run into others. Group size is limited to about 8 people. Many tour companies across Belize offer trips to Actun Tunichil Muknal, however it is easiest to access from the small city of San Ignacio. I signed up for a tour one day in advance, at a cost of $80, through Mayawalk Tours. The drive and cave guide were both excellent. See all of my photos from backpacking in Belize on Flickr. Got a random question for you :) as always! lol. How do you perceive Buddhism will alter your travel outlook and and you will feel whilst traveling? Im just starting to explore buddhism and looking back, Id probably have had quite different experiences traveling than what I had. Interesting question. I spent a bit of time during my lunch break reflecting upon it. One of the reasons I was attracted to Buddhist principles was the way they have seemed to have such an approachable and practical application. On my 2005 trip to Costa Rica, and my 2006 trip to Belize, I brought books on Buddhism by Thich Nhat Hanh and Lama Surya Das so I could easily access and practice the ideas on the road. For example, in Puerto Viejo Costa Rica when I felt extremely tired from the heat and sun exposure, I reminded myself that suffering is an inseparable part of the human condition, and that luckily, so is impermanence. I reminded myself that eventually I would feel better, so I rested up in a hammock with a wet bandanna on my forehead. I tried to allow myself the downtime, despite the feelings that I should be up and social around the hostel/town because I only had a limited amount of time on my trip. Practicing meditation can generate an awareness of the constant swirling of automatic thoughts and “delusions” in our minds. We can use this new skill to be more present in our environment – whether conversing with people, or observing the waves of the ocean. There’s no doubt it’s easier to be present when we’re on vacation because there are so many new stimuli. I really wonder what it will be like when I’m on something of a “permanent vacation,” and everything is new all the time, and I don’t really have the pull of a job and home in the back of my mind. I’m sure it’ll be replaced with new stresses that will challenge me just the same! Lastly (before I talk your ear off), I have a much greater compassion for people and animals than I use to, which I will no doubt be putting to use in the poorer regions I visit. I love that other people have found this hidden treasure in Belize! It was such an amazing experience! On Andrew Zimmern's premiere episode of Bizarre World last month, he was in Belize and did the ATM cave tour. Visited the ATM cave last month. Like you, was very impressed. The rewards of seeing all the remains of pots, bones and other artefacts were a treat at the end of the long trek through the dark wet cave. A well run tour, and good that they keep numbers down to prevent overcrowding in cave.